A year later… why is it collage never gets boring? This entry was posted in Creative endeavors, summer 2010. Bookmark the permalink. 2 Responses to A year later… why is it collage never gets boring? Woops – 2nd line – that should be “word” in front of “create”, not “work” – although the beading and collaging frenzy is sometimes named “Aunt Deb’s Sweat Shop” so maybe “work” works? I made this collage when nieces, Michele and Grace were at my house for a sleep-over. There is fabric in the middle with the bird and work “create”. We take our collaging very seriously and the girls and I are up til all hours getting our creations just the way we want them. The sleep-over also included visits to “Color Me Mine” in Bernardsville – a pottery painting place, and “Glassworks” in Morristown where we made designs with glass we cut and assembled in various patterns. We ate at 90 Acres in Peapack with Uncle Paul one evening – a very cool new place that was originally the King of Egypt’s “home” – restaurant is what was the old carriage house. Food is great – they should have a blog “The 90 Acres Dish”!! Anyway, back to collaging. Michy and Grace make ab fab collages, and we never tire of doing them. I will get some of theirs scanned so you can see their artistry. 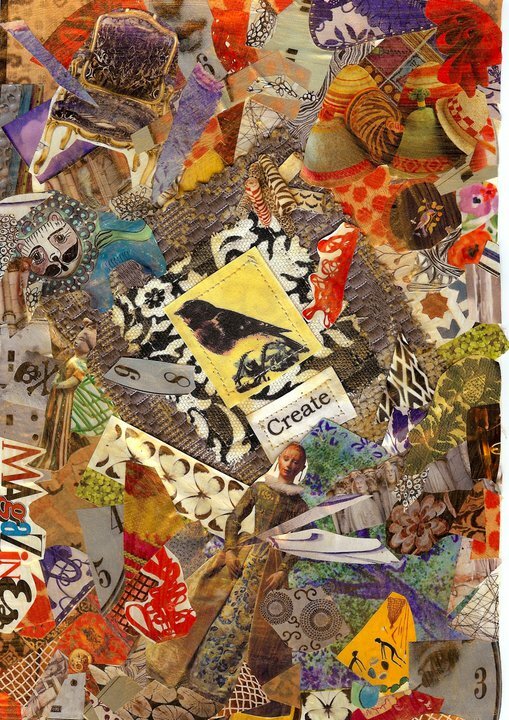 Save your old magazines everyone, and bring them to the shore with you – they are our best source of collage material!